The Caenorhabditis elegans, a small worm called a nematode, scurrying across a Petri dish has helped lead to discoveries about community-associated MRSA (methicillin-resistant Staphylococcus aureus). "In the last year this organism has killed more people in the United States than AIDS," said Kathleen Dannelly, an Indiana State University associate professor of biology leading the community-associated MRSA study. "It's going to get worse." MRSA identifies a staph infection that is unable to be defeated by most penicillin-based drugs. Community-associated MRSA varies from the hospital-related one, which tends to be a more virulent strain picked up by people admitted to hospitals. Community-associated MRSA can cause toxic shock syndrome or blood and bone infections. "They've picked up this incredible invasiveness mechanism that we don't understand at all," Dannelly said. "It's frightening what it can do." A normal staph infection looks like a boil and remains in the skin. With MRSA, in the worst strains, the bacteria can eat down through the flesh to the bone in 36 hours. Dannelly became interested in studying the community-associated MRSA in 2004 when an outbreak infected members of Indiana State University's football team. Players who received cuts and abrasions during games and practice found themselves diagnosed with MRSA and, in some cases, undergoing surgery for it. Many people unknowingly carry MRSA on their skin as part of their bacteria and remain uninfected as long as they receive no cuts or scrapes to allow the bacteria to enter the body, Dannelly said. Six years ago, Dannelly and her students conducted a blind sidewalk study, swabbing the noses (MRSA thrives in warm, moist places) of 500 students, faculty and staff. They found that 1 ½ percent carried MRSA bacteria. Five years later, Dannelly and her researchers again conducted the blind study and they found the number of MRSA carriers had grown to 2 percent of the study group. "The people had no idea they were carrying it," she said. In the meantime, the scurrying nematode, which is only a few millimeters long, helped lead researchers to an interesting discovery. By comparing the genomes of community-associated MRSA and the staph infection, they found significant differences to investigate. "This organism is so invasive we thought there have to be toxins that we don't know about," Dannelly said. After cloning 15 genes, researchers have, thus far, purified six to determine what the proteins do. Researchers have found that MRSA's different proteins have unique functions such as sticking to human cells or interacting with white blood cells. One project led researchers to a novel toxin that affects the nematode, which eats bacteria and has an immune system and nervous system in its body making it ideal for tests. They put the worm in the Petri dish with the toxin and watched. "When you feed it the toxin it runs to the edge of the Petri dish to try to escape," Dannelly said. "This toxin kills the worm in eight minutes. It's really toxic." Now researchers are testing the toxin on tissue cultures to see how it affects human cells. 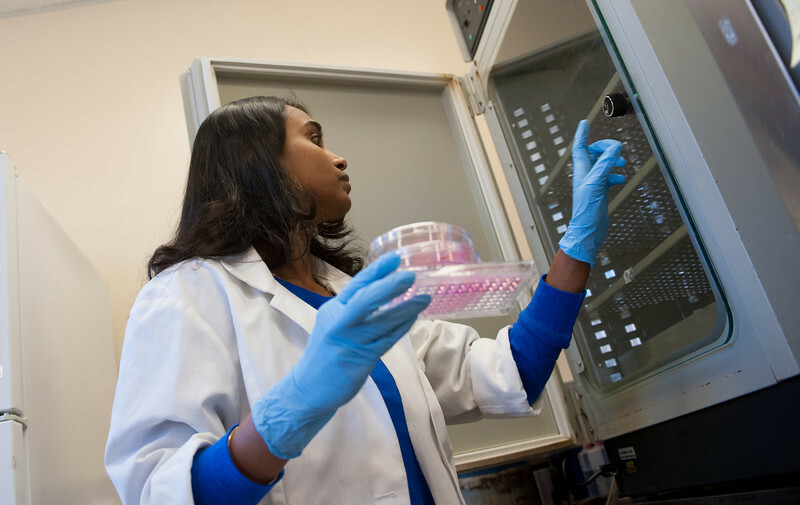 As doctoral student Anupama Ramalinga worked in the lab among the tissue cultures, she said the toxin only seems to work on human cells, not on other mammals on which she tested it. 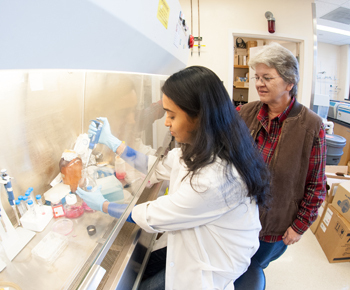 She studied tissue cultures under the microscope and counted the number of cells so "in the test I know how many cells my protein killed," she said. Research into MRSA's affect on humans and its proteins' roles remain important to figuring out the bacteria and how to stop its advance. "If we don't know our enemy we can't defeat them. 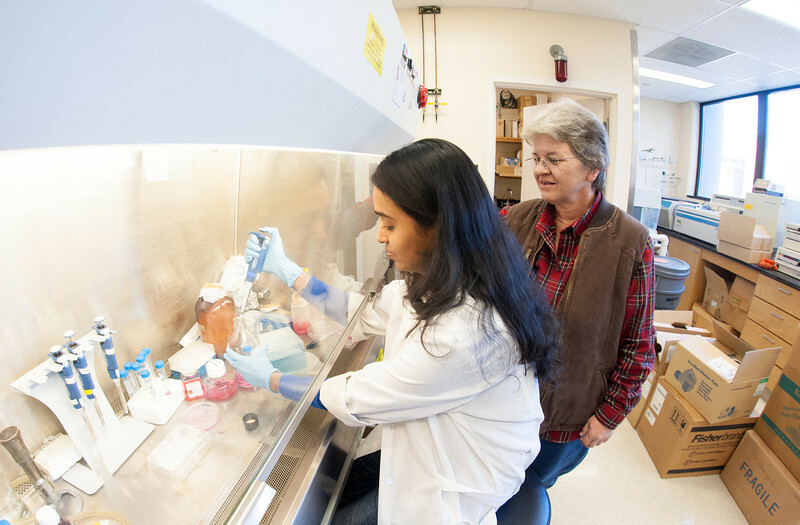 If we know our enemy, we can come up with new ways to defeat them," said Ramalinga, from Bangalore, India, who is researching the toxin's effect on tissue cultures. "This type of research will help us understand the bacteria, why it's becoming more robust, stronger." While Ramalinga finishes her research and works with Dannelly to author a paper on the findings, some common practices can help people fight the bacteria. People can take steps against community-associated MRSA and good personal hygiene is the first step. Also, Dannelly said washing with antimicrobial soap and using a disinfectant in the nose can eliminate the microbes that cause the disease. "You can disinfect a person and change their flora," she said. A nematode helped lead researchers to an interesting discovery.